Using different HW Features in a Box - solaris... wtf?!? So what I thought about are classic tasks normally found on several servers, build in one box. All of them could benefit from different features which come with M7 or S7 chips. The database in the backend will profit from the big memory bandwidth and the SQL Offload Engines called DAX, data analytics accelerators. In the combination Oracle says in their PowerPoints the database could scan up to 170 billion rows per second with those streaming engines with a measured bandwidth from 160GB/sec per socket. Wow… and that’s measurement; the M7 processor hardware facts are talking about 4 memory controller units per socket which could handle 333 GB/sec raw memory bandwidth per processor. (It seems that DDR4 is the “bottleneck” not the CPU…) compared to the latest Xeon E7 88xx v4 (Q2/16) with 102GB/sec mentioned on Intel’s ARK technical details pages. The next layer could be the application itself. With 8 threads per core a perfect fit for a high user load and with critical threads the process has more exclusive access to the hardware. Perfect for running a wide mix of workloads, some will be designed for throughput, others for low latency. The third level could be something like a reverse proxy with a SSO backend or something. The proxy could take the application sessions if not already encrypted and use the build in cryptographic accelerators on the processor to encrypt. Solaris itself and some standard applications using these engines already, like Apache, IPsec, Java, KSSL, OpenSSL, ZFS Crypto. 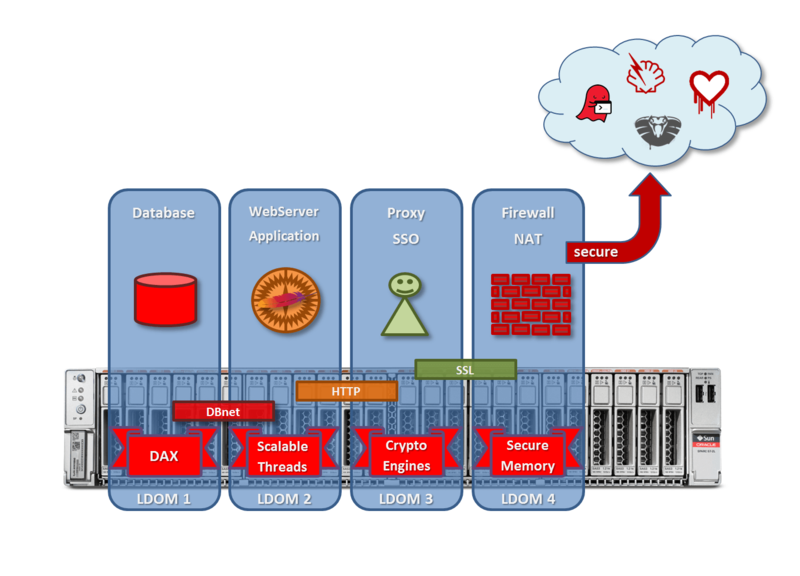 But not only Oracle software like the database and WebLogic are supporting Solaris’ Crypto Framework, also IBM with DB2, Informix, IBM HTTP Server or WebSphere are certified with IBM Global Security Kit to use SPARC’s hardware encryption (IBM GSKit v8). So imaging using all of these features a whole datacentre could be hosted on a single server or if it comes down to availability you could build a cluster with failover or live migration between the servers.